• “P” bulb width is 1-1/4″ O.D. with a height of 1-3/8″ O.D. SKU: WINDSOR-PERFT Category: Weather Seal Brands: Repair Parts. 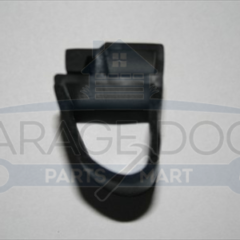 Parts Mart is your home for the Windsor P-bulb garage door bottom weather seal. These seals are sold by the foot and are designed exclusively for Windsor garage doors. This P-bulb weather seal fits 240, 224, 575, 730, 735, 790, 775, 730CHD, 750CHD and 755 series garage doors. The P bulb seals are made from a black vinyl compound for strength and durability. The total height of the seal, including the P, is 1 ¾ inches. Installing this seal is not too difficult. Parts Mart recommends the installation to be done by two people, one feeing the seal and one pulling it through the channel. In addition, you can be assured that you are using the proper seal if your old seal looks like the P-bulb seal. The age of your Windsor garage door does not matter because Windsor has only ever made one size P shaped bottom seal and this product, item number WINDSOR-PERFT, is it.